Should you buy a used Subaru Forester? More tall-wagon than sport-ute, Subaru’s Forester has always attracted Subie disciples and their newly converted ilk who crave something a little different. The automaker’s horizontally opposed “boxer” engine and all-wheel-drive architecture certainly qualifies on that count. But Subaru is becoming more accepted by the mainstream these days so the bandwidth of potential buyers for used models is rightfully expanding as well. Might you be among that throng? Originally designed for airplanes – Fuji Heavy Industries, Subaru’s parent (only recently renamed Subaru Corporation) is an aerospace company – the flat-four lies low in the engine bay to reduce the car’s centre of gravity and help handling. The engine’s opposed pistons quell the typical four-cylinder’s inherent paint-mixer shakes by reciprocating horizontally and in opposite directions, two to a side. Thanks to its longitudinal orientation, the engine accommodates equal-length driveshafts to minimize torque steer and provide good stability and traction, telltale characteristics of Subaru’s “symmetrical” all-wheel drive system. Having marketed all-wheel-drive models almost exclusively in Canada since 1997, you’d think Subaru would have a lock on the burgeoning SUV/crossover segment. While sales have been brisk, the little automaker ached for a bigger slice of the action. So it recast the Forester as an authentic-looking crossover sport-ute for 2009. Call it Subaru’s reforestation effort. The redesigned third-generation Forester gained a stouter unibody, a 9-centimetre longer wheelbase, a significantly broader track, 23 cm of ground clearance and a new unequal-length control-arm rear suspension to yield more cargo room, as well as enhance cornering ability. Added high-strength steel contributed to a weight gain of about 70 kg, but at least it garnered an Insurance Institute for Highway Safety (IIHS) top safety rating for the Forester. Inside, the cabin benefited appreciably from the greater dimensions – the formerly cramped back bench grew to best in class – while retaining the expansive headroom and the seats’ “h-point,” set at an optimal height to allow easy ingress and egress (seniors should take note). However, owners saw an odd discrepancy in the front seating arrangement. “The passenger seat is mounted so low, with no height adjustment,” observed one owner online. At least the driver’s seat does rise and fall on demand. From that perch owners lauded the excellent sight lines all around. The updated instrument panel was elegantly simple and helpfully rendered with three large rotary HVAC controls and a radio that was mounted high in the driver’s line of sight. Clearly, the chief priority inside was maximum functionality, which the Forester delivers in spades. Making a return engagement was the familiar 2.5-L SOHC four-cylinder boxer engine, albeit tweaked for 2009 with revised camshaft timing and new intake and exhaust systems. The base engine churned out 170 hp and 170 lb-ft of torque. The be-scooped XT model added a turbocharger and intercooler, generating 224 hp and 226 lb-ft of grunt from the same displacement. Being a Subaru, all-wheel drive with a viscous limited-slip centre differential was standard. Unlike many crossovers that drive their front wheels and dispatch torque to the rear set only when slip is detected, Subarus drive all four wheels all the time, no waiting. A five-speed manual transmission was standard, while the four-speed automatic (a Smithsonian relic) was optional with the base engine and mandatory with the turbo engine. 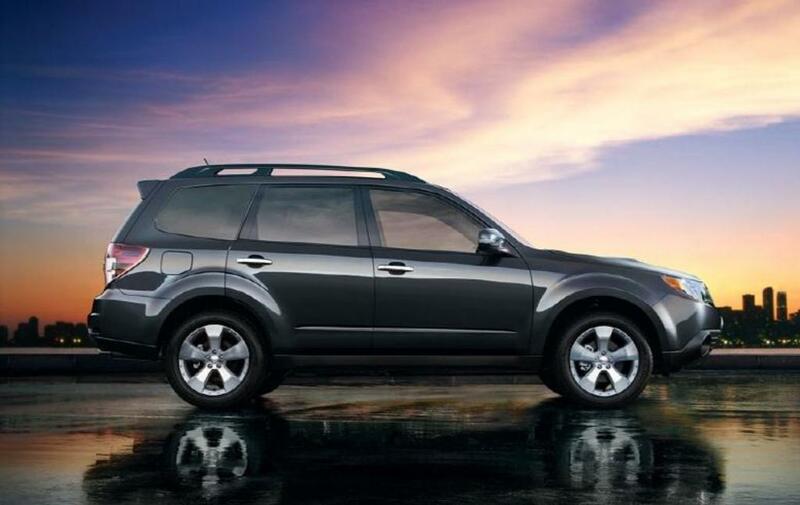 Every Forester included antilock disc brakes with brake assist, traction and stability control, front-seat side airbags, and front and rear curtain airbags. While its outward appearance didn’t change, the 2011 Forester acquired a significant mechanical update in the form of a fresh engine. The new 2.5-L boxer, dubbed the FB25, gained 41 cc of displacement and dual camshafts in place of the SOHC design. The aluminum-block flat four still made 170 hp, but torque increased marginally to 174 lb-ft. The advantage? Slightly improved fuel efficiency and performance. The turbocharged Forester 2.5XT remained unaltered. For 2012, Subaru finally addressed the inequities of the front seats by making a height-adjustable passenger seat standard. Amen to that. No major redesign ensued until the 2014 model year. Run-of-the-mill Foresters could sprint to highway speed in 9.7 seconds, which seemed awfully leisurely even among compact crossovers. The updated 2011 model with the FB-series engine trimmed a full second off that time, and that’s with the same ancient four-speed slushbox. Conversely, the turbocharged XT could chirp its rubber on the way to 97 km/h in a fleet 6.7 seconds. Owners adore the ute’s car-like agility and composure on various road surfaces, and value the sense of invincibility that comes with piloting a Subaru through adverse weather. What they disliked was its propensity to rattle and chatter on rough pavement. In terms of fuel usage, the Forester performs well for an all-wheel-drive wagon, but relatively poorly for a four-cylinder car. Expect not much better than 11.7 L/100 km (20.1 mpg US) around town, say owners. The turbo XT quaffs premium fuel. Subarus have long been reputed to be reliable, but a spate of head gasket failures in the previous generation Forester (and other Subie models) challenged that reputation. Now there’s a new scourge that’s taken some shine off the brand: severe oil consumption. “Have had excessive oil consumption from day one. Car would consume 3 to 4.5 litres on a thousand-mile trip, over and over again. Subaru put a new short block in it,” posted one disgruntled owner of a 2011 model online. Indeed, some dealers have begun replacing engine blocks under direction from the factory. Reportedly, 2011-13 Foresters are part of a class-action lawsuit for this issue, although it appears to involve more models and more model years, give the widespread application of the FB25 engine. Beyond oil consumption, Forester owners have noted a few mechanical lapses in small numbers, including turbo failure, worn-out transmissions and catalytic converters, short-lived wheel bearings and malfunctioning air conditioners. Oddly, the driver’s seat can break and collapse, according to a few owners’ accounts, and the rearview mirror may detach from the windshield. The made-in-Japan Forester has its devotees, but the newer DOHC boxer engine has exhibited unsettling oil consumption that some owners equate with trouble. If you make a habit of monitoring the dipstick and keeping a bottle of synthetic oil on hand, then the Forester may serve you well.